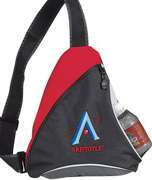 Personalized Sling Packs Custom Embroidered or Printed in Bulk. Promotional, Very Inexpensive. Lowest prices in America. Red, Royal Blue, Lime Green, Yellow, Gray, Pink, Orange. 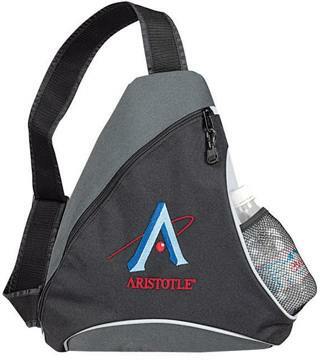 Bulk Personalized Sling Packs, made of sturdy 600d polyester and custom imprinted or embroidered with your logo. 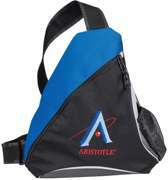 Budget Prices in USA and Canada for wholesale personalized sling packs . Free artwork design. American clients pay no taxes. Unit prices below are for blank (not personalized sling packs), or they include your 1 color, 1 side custom imprint, or they include 5000 stitches of custom multi-color embroidery. Assortment is allowed. 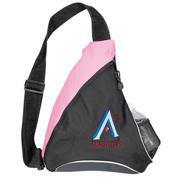 Additional Imprint colors: add $0.65 per imprint color, per sling bag. You don't pay Setup Charges for embroidered sling bags, but you need to pay for the Embroidery Tape (in case you don't have one): $18.00 for each 1000 stitches of embroidery. 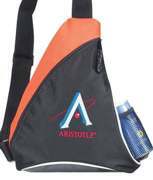 Extra-wide single strap, adjustable for hand or shoulder carrying, spacious interior with zippered closure (large enough to fit file folders), mesh pocket for water bottle or cell phone. Colors: Red, Royal Blue, Lime Green (Apple Green), Yellow, Gray, Pink, Orange, all with Black trim: see pictures. Assortment is OK.